The ABBUC SIO2USB came with a very nice case and USB Drive and ready to use. Each of the devices has a serial number embedded within it. SIO2USB also has super email and web site support. This device can be updated from an ATR. SIO2USB can have its firmware updated from a special flash program which is easy to do. The SIO2USB only emulates 3 drives. The Internal Support Program is easy to use. This device also has a real time clock within the device. I updated the RealDos TDLINE2 file to detect the SIO2USB and pull time from it and pass it to the tdline. ABBUC also provide to programmers good documentation to write your own programs for it. If you are thinking of getting an SIO2nnn Device and you are not able to work with mounting a pc boards within your computer and need a real time clock this device would be your best purchase. I like every part of this device except it only emulates 3 drives. This is the most professional SIO2nnn devices that you can just up and purchase. From the internal software you can copy an ATR and create an ATR. as well as other functions. If you look at what an R-Time 8 and any of the other sio2nnn devices cost this by far the best buy! The SIO2USB Interface is a peripheral device that can be attached to an ATARI 8-bit computer using the SIO-Bus. It emulates one or more ATARI floppy drive(s) and does not require any special drivers or operating-systems; it is fully compatible with all ATARI DOS systems and extensions. Because the device is connected to the SIO-Bus, it is not necessary to open or modify the ATARI. The device is powered by the SIO-Bus and does not need an external power adapter. The data are stored on standard USB mass storage devices (USB FLASH Drives) as ATARI-Imagefiles (ATR on a standard FAT file system). Creation, selection and deletion of Imagefiles can be done either by using the built-in keys on the device and the LC-Display or by using a configuration program (included in the distribution package) from the ATARI. 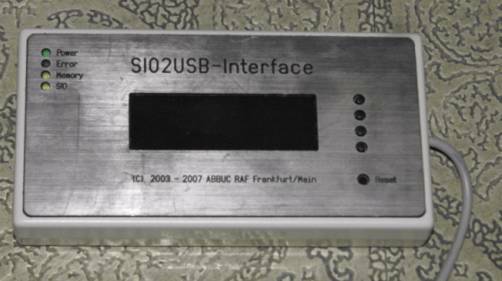 It is NOT necessary to own or run a PC or Mac to operate the SIO2USB Interface. All necessary operations can be done either at the device itself or from the ATARI. As an alternative, a PC or Mac can be used to exchange Imagefiles from/to the USB FLASH Drive or to create backup copies. By using the internal Real-Time Clock, each modification (write access from the ATARI) on the Imagefile will update the current date and time information on the Imagefile. This permits one to find the most recently changed Imagesfile with the same name in the file system. Dates and times are also available for the ATARI and can be used by proprietary programs or by ATARI DOS systems that support date and time. The internal SIO2USB Software (Firmware) can be updated by the user from within the ATARI without a PC or Mac. We will publish Imagefiles for Firmware updates on the SIO2USB website which can be downloaded and copied to the USB FLASH Drive or sent on an ATARI 5 1/4" disk. The Firmware update is done from within the ATARI WITHOUT any special programming device or additional personal computer. 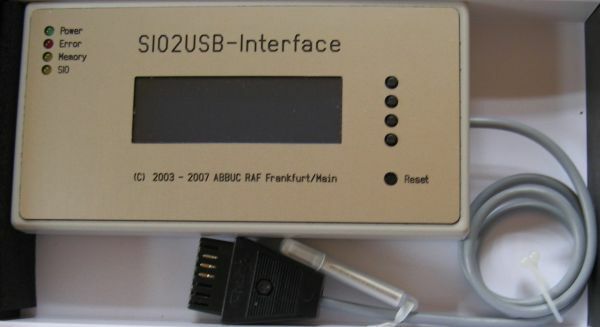 The SIO2USB-Interface allows you to operate an ATARI computer with virtual floppy drive(s) without using a REAL floppy drive or any PC with SIO2PC software and interface. Therefore it is a light-weight alternative for real floppy drives or SIO2PC + PC/MAC combination. In addition, other SIO devices (real floppy, SIO2PC, tape-drive or printer) can be used with SIO2USB together at the same time on the SIO-Bus. The SIO2USB Interface will be available only as fully built-up device in a plastic case and is directly usable (Plug&Play). A USB FLASH Drive is supplied with each SIO2USB containing all configuration programs, tools and documentation, so you can start immediately. The display is a special low-power backlight LCD to avoid too high load for the ATARI computer via the SIO-Bus.